Set smack dab in the midst of New Zealand’s North Island – and sitting squarely on the notorious Pacific Rim of Fire – Rotorua marks a steaming and bubbling cauldron of dynamic geothermal activity. 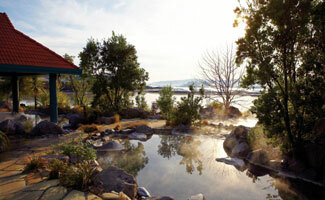 Oozing with boiling mud, colorful mineral pools, steam-spewing geysers, ancient caldera-capped lakes, and an overall fantastical geography, Rotorua's geothermal landscape ensures its firmly fixed place on the country’s well-trodden tourism circuit. Visitors here will discover abundant opportunities to contemplate the earth’s raw geothermal power and to ogle its otherworldly landscapes – and will also encounter a spa town culture that maximizes the natural spa features just underfoot. 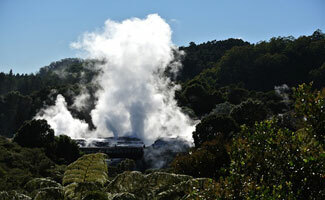 Some of the region’s best geothermal landscapes are to be found on the outskirts of town, like at the Waimangu Volcanic Valley, a 20-minute drive south of Rotorua. The enchanting ecology showcased here today marks the world’s youngest thermal area, the result of a late 19th-century eruption by Mount Tarawera – plan on two hours to walk the trails here, glimpsing volcanic craters like Frying Pan Lake (the largest hot water springs on the planet) and the massive, impossibly blue Inferno Crater; steaming streams and boiling mud pools; and the remarkably regenerating, thermally-adapted plant life ($29/adults, $9/kids). Nearby, Wai-O-Tapu Thermal Wonderland offers even more brilliantly multihued geothermal displays, like the colorful Champagne Pool, New Zealand’s largest boiling mud pools, and the Lady Knox Geyser (she’s induced to erupt at 10:15am daily; $27/adults; $9/kids). Closer to town, and free of charge, the public Kuirau Park’s walking tracks highlight more raw geothermal beauty with boiling mud pools, crater lakes, and steaming sulfur vents. Also in town is the site of the region’s most famous geyser, Pohutu, set on the grounds of Te Puia ($39/adults; $20/kids). Not only will a visit here grant you front-row seats for the steaming geyser spectacle (it erupts up to 20 times a day and can reach heights of more than 65 feet), but you’ll also gain insight into New Zealand’s indigenous Maori culture, which is alive and well in Rotorua (more than a third of the local population is of Maori descent). Te Puia demonstrates how the land’s natural geothermal properties were historically used by Maori people for cooking, bathing, and natural heating, and also serves as a great introduction to Maori culture through daily cultural performances (extra fee applies), guided tours, and Maori carving and weaving demos (plus, you can see a kiwi bird, New Zealand’s national symbol, in a nocturnal enclosure). Just next door, the Whakarewarewa Thermal Village is a living Maori village, which better illustrates how daily life unfolds amidst the steaming, bubbling landscapes here – don’t miss their excellent cultural performances, held twice daily, and included in the price of admission ($29/adults; $11/kids). If all of those bubbling hot springs have you craving a soothing soak of your own, head to the Polynesian Spa for a bath in one of their therapeutic pools (rates from $12/adults; $6/kids). Choose between family, adults-only, private, and exclusive lakefront spa areas, each with their own velvety alkaline mineral pools, set at varying temperatures. Do book a splurge-worthy signature mud body wrap at the spa ($124), for a rejuvenating scrub and wrap utilizing Rotorua thermal mud; the rate will also get you access to a dip in the lakefront spa pools. For a place to rest your head – that also has spectacular lakefront views – check out the very best bed-and-breakfast in town. The excellent-value, two-room Rising Trout B & B provides exquisite views of Lake Rotorua (kayaks are available on a complimentary basis), some of the finest Kiwi hospitality around (the accommodations are run by an endearing husband-and-wife team, along with their cuddly cat and dog), lakefront sunset happy hours, and lip-smacking home-cooked breakfasts, all included in the bargain rates (from $152/night).